How’s daylight savings time treating everyone? I love the earlier morning light. It’s so natural to wake up with the sun, and I’m savoring it before the days start to close in on both ends. The nights? That’s a different story. Pre-5 PM sunsets make me want to do nothing but sip pinot noir and eat cheesy things by a fake electric fireplace. I started pre-gaming DST last week, as my very soon-to-be hubby and I watched Mets baseball and dined on the couch with several living room friendly dinners: lentils and cheese, enchiladas, and these cheesy rosemary potatoes. I was finally off antibiotics from my annual fall throat infection, so I was like, bring on all the wine and food I’m finally hungry for! 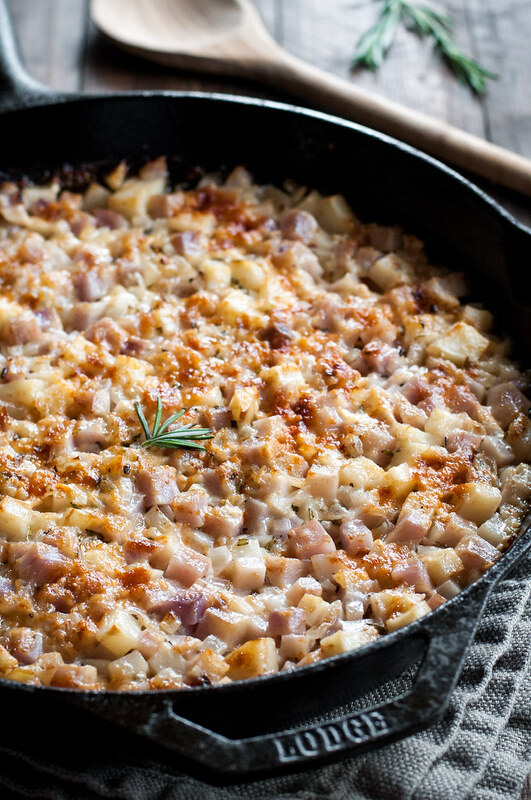 Tomorrow the onslaught of family and friends begins to trickle into the twin cities for our Saturday wedding, but I have to take a moment, with Thanksgiving on the horizon, to bring you this cheesy potato recipe. Roadside potatoes if you want to get technical. Why are they called roadside potatoes? I can’t answer that question (can you? please? ), and neither can my mom, whose church cookbook recipe by that name I only slightly modified for this rosemary-blue potato-white cheddar version, and who has been feeding her family this praise winning side dish year-round for longer than I can even remember. It’s the kind of recipe that will always instigate a battle of the leftovers. If there are any. Blue potatoes are totally optional, as are fresh potatoes. 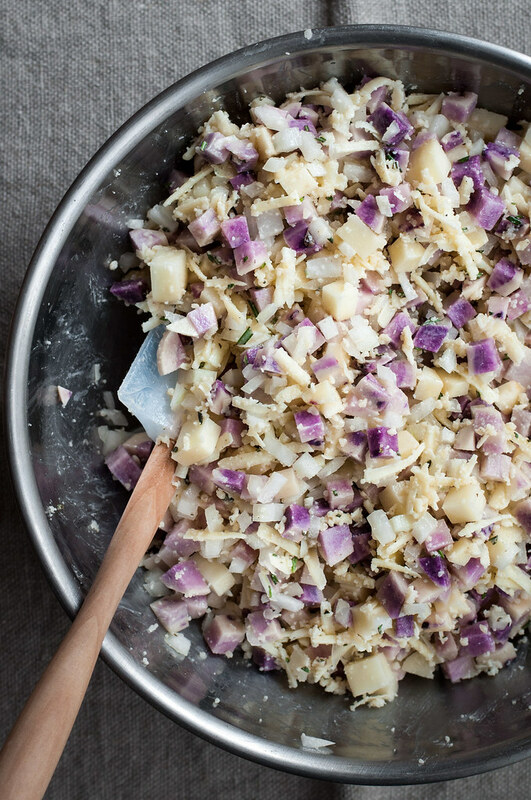 My biggest alteration to the original recipe was to substitute fresh potatoes for a two pound bag of frozen diced hash brown potatoes, because I like fresh things, and because I can’t resist a dirt caked blue potato at the fall farmers market. 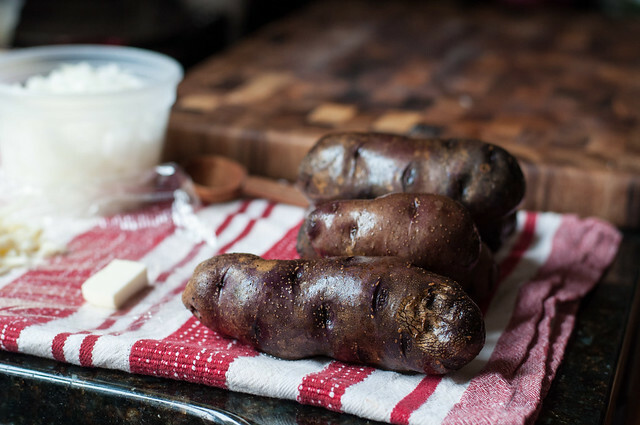 But, if you’re feeding these delicious taters to a crowd at Thanksgiving or another cold weather party (or summer, because thank goodness cheese never goes out of season), I will not judge you for the use of frozen potatoes. Sometimes I find 45 minutes of potato chopping therapeutic, but when I have 13 people running around my kitchen, that time is better spent futilely trying to control the chaos. If you’re looking for Thanksgiving menu ideas, check out what I made last year: it was quite the production. This year is sure to feature a meatless Thanksgivng and so many of these tender, cheese covered bites of roadside rosemary potatoes. No more duckies, much to the dismay of my new HUBBY! 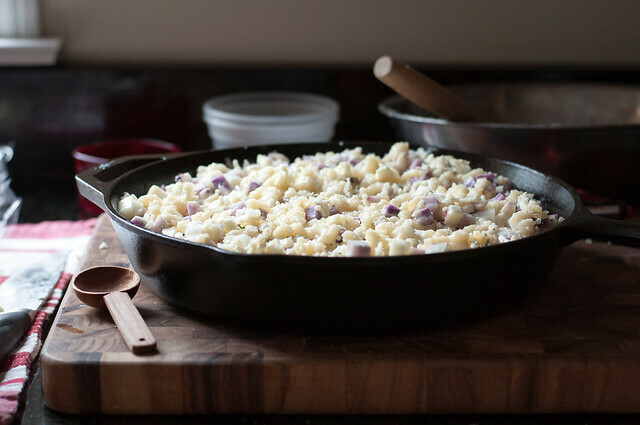 It’s going to be a big ol’ side dish party. And let’s be honest, potatoes, stuffing, cranberries, and maybe a kale thing or two are the most highly anticipated and well enjoyed parts of any fall or winter feast. Can’t wait!!! P.S. Next time we see each other I will be an old married lady! 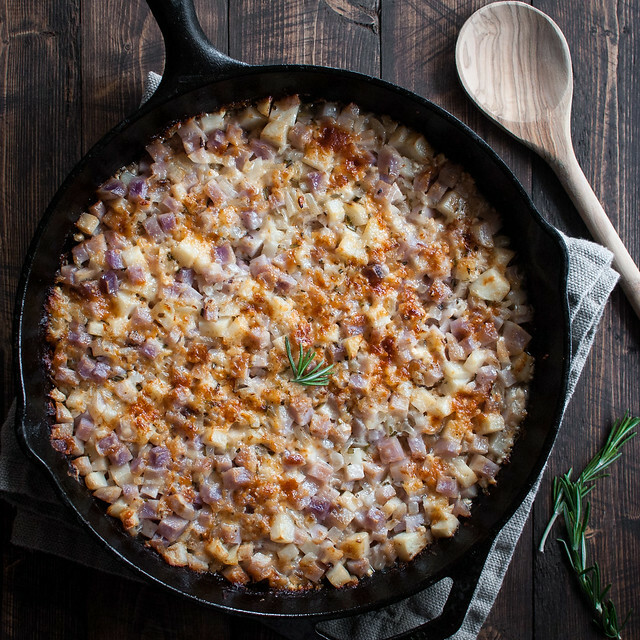 Cheesy potatoes are a party and potluck hit year round, but rosemary makes them especially cozy for cool weather get togethers and weekend dinners. 2 lbs. potatoes (see notes), peeled and diced ¼"
Preheat oven to 350 (F). 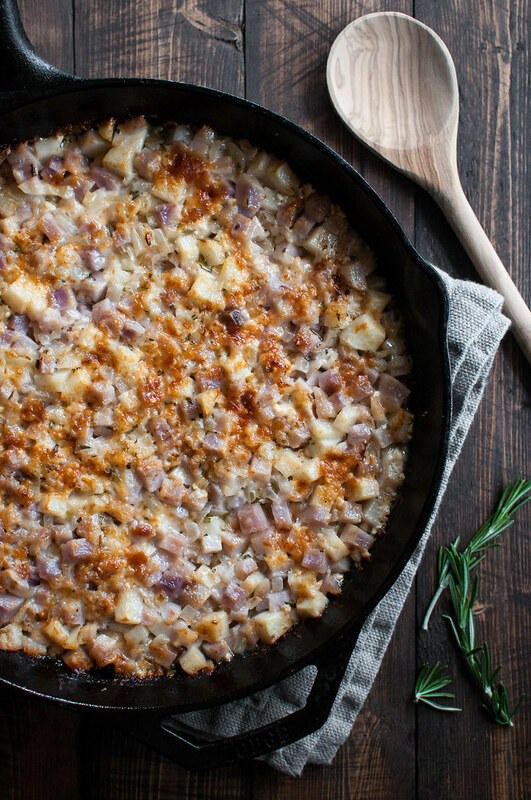 In a large mixing bowl, toss potatoes, onion, rosemary, ½ cup parmesan, all the cheddar, 6 tablespoons melted butter, 1 teaspoon salt, and ½ teaspoon (or more, to your liking) white pepper. 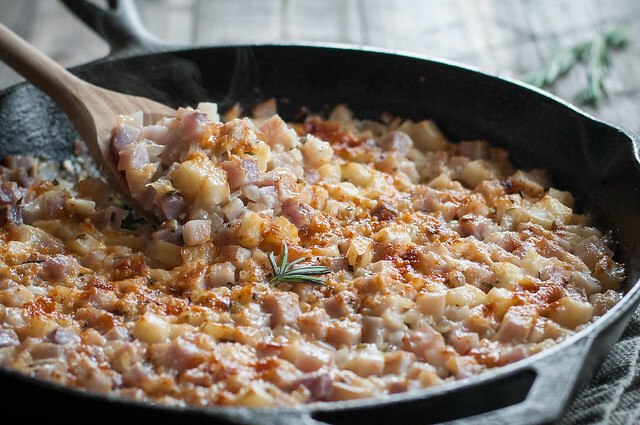 Spread in a lightly greased baking dish or a well seasoned large cast iron skillet. Pour milk evenly over potatoes. Stir remaining ½ cup parm into the last 2 tablespoons melted butter. The mixture will be more of a thick liquid than crumbs. Drizzle evenly over potatoes, sprinkle with paprika, and cover tightly with foil. Bake 40 minutes. Remove foil and bake another 20 to 35 minutes, until bubbly, browned on top, and potatoes are very tender. For an extra golden top, broil for a few minutes. Serve immediately, or, if needed, keep warm in a low oven until ready to serve. 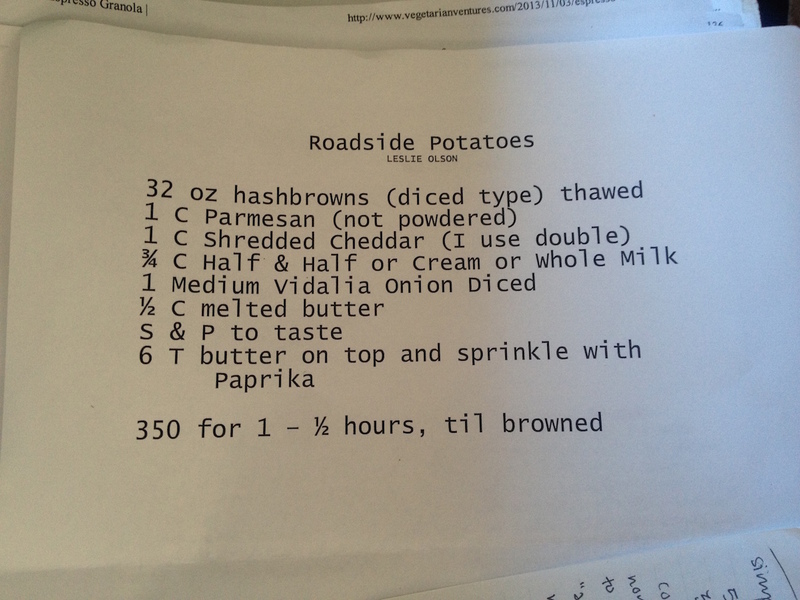 Most traditional roadside potatoes recipes call for a 2 lb. (32 oz.) bag frozen diced hash browns. To speed up the process, you can substitute them. Some recipes instruct thawing and some don't. I suspect either will work, but starting from frozen will require a longer cook time. 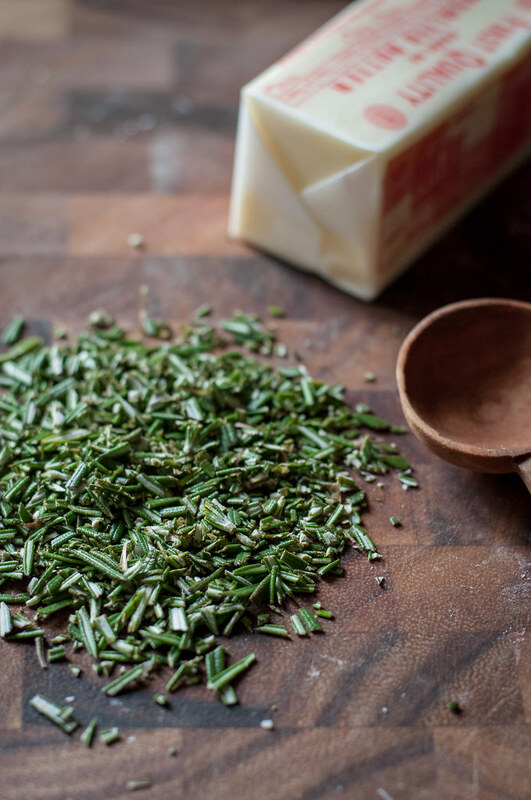 If you're feeding picky eaters, you may want to omit the rosemary (or leave it in--more potatoes for you!). The fragrance, however, is stronger than the flavor. Adapted from my mom's classic recipe for roadside potatoes. Potatoes freeze well after baking. Note: This page contains affiliate links. It does NOT contain sponsored content. Affiliate links (to products I recommend, on Amazon) offset my ingredient and website maintenance costs, so I can keep bringing you classic comfort recipes like this one. Thanks! If using frozen are we using the plain frozen? Bc some have peppers and onions. I’ve always gone for plain, but the peppers and onions wouldn’t hurt! Just made it and it’s delicious as is, but I’m also going to experiment with adding just a little flour to the mix next time to help everything hold together more uniformly–some of the butter definitely sinks to the bottom.